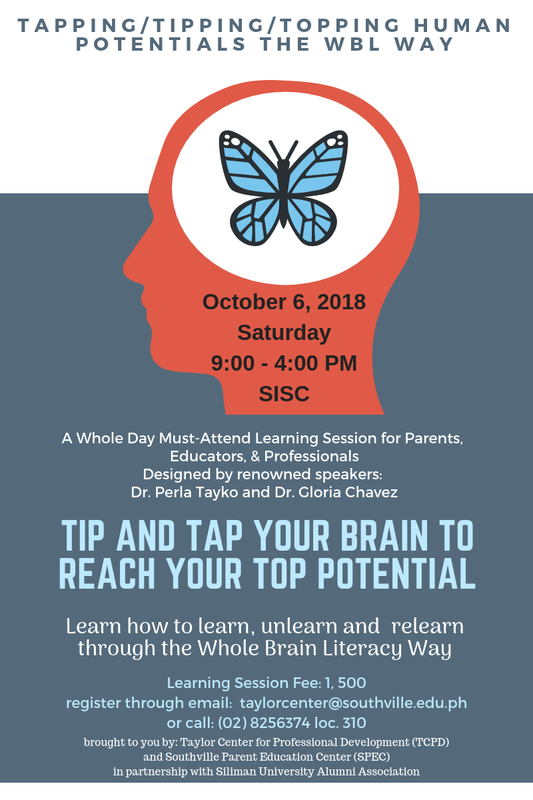 “The human potential is endless as long as we learn how to TIP it, and TAP it to be able to reach the TOP of our potential,” explains Ms. Phi Anh De Castro, Southville International School and Colleges Parenting Education Center Officer, of the upcoming learning workshop “Transformative Learning & Change Using Whole Brain Literacy (WBL) set on October 6, 2018, 9:00-4:00PM, at the Luxembourg Hall. The seminar will feature renowned speakers Dr. Perla Rizalina M. Tayko and Dr. Gloria S. Chavez who will expound on discovering and appreciating the patterns of thinking needed to learn and lead. Furthermore, it will help participants develop and acquire the “human information processing skills set” for dealing with issues. There will also be an activity where attendees will be able to apply and actualize the “thinking through processes” in the teaching/learning environment. To be held in partnership with the Silliman University Alumni in Metro Manila (SIMM), the workshop is open to parents, educators and professionals. Those who are interested to attend may contact Ms. Valine Divinagracia or Mr. Joebert Pagdato at office no. : (02) 825-63-74 local 310.